Update: Admin Bar, Animated Avatars + more! Hey everyone, yet another exciting update! Over the past few months we've been analysing traffic patterns among site usage, particularly the admin panel. Here's what Google Analytics reports on the most widely used pages inside the admin panel: We see the majority of admins spend most of their time managing site settings, members and panels. 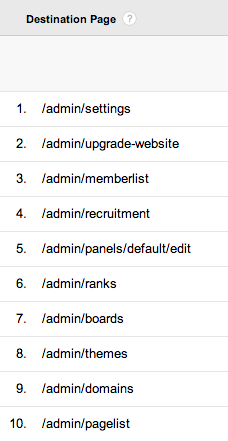 With this in mind, we've added links to your admin panel in our new admin bar. 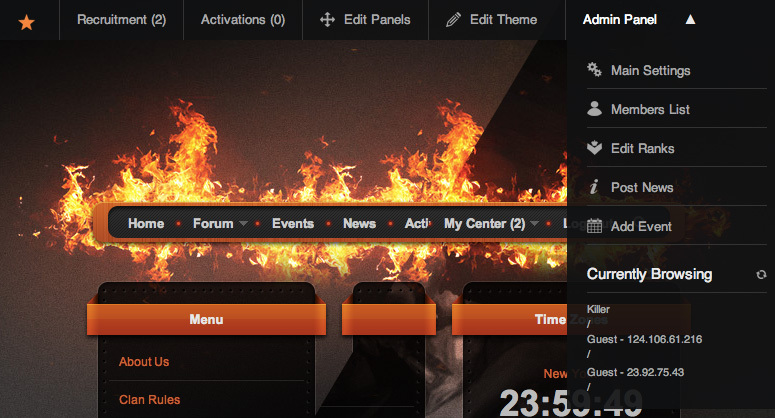 Sometimes admins get confused about which page to edit with regards to the panel layouts and the theme. So we've added in links to edit both the panels and the theme for the page you're currently viewing, we're hoping this will clear up quite a bit of confusion. For premium users, we've added a new "Currently Browsing" section. This shows a list of users currently browsing your website, for both logged in users and guests too. This feature should have been added in many months ago, since many of your have been requesting it. Well, it's finally here. Now you can upload your own animated avatars/user pictures. Each image will automatically be resized to the correct dimensions. With every update there are also some smaller features added. Options to set the default primary and secondary ranks as soon as members register. Just go to Main Settings > Membership & Registration to set this up. Added the option to disable subforum links in the forum index. This can be found in Main Settings > Misc. Added admin access option to control permission over the payment history page. Recurring Team Pay payments. The Team Pay panel now comes with a "recurring" option, allow your members to contribute towards the cost of your site on a regular basis. This is completely optional and your members can cancel their PayPal subscriptions from inside their PayPal account. Thank you everyone for your continued feedback. If you experience any issues, never hesitate to open a ticket from inside your admin panel.